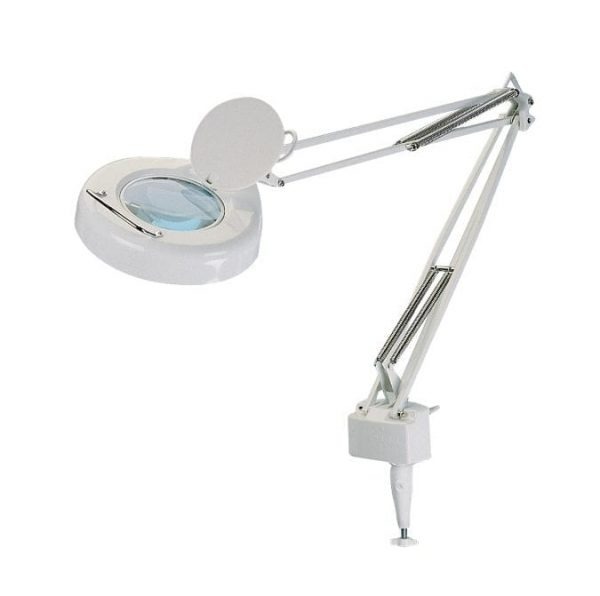 This is a high quality, all metal frame construction magnifier which features a super bright LED inside the magnifier head. The magnifier itself is made of glass and is a 3 dioptre lens, with a metal handle for quick repositioning. An adjustable joint between the two flexible extension arm assemblies (total extended length 900mm) allows exact positioning of the lens, and is assisted by a further thumb screw next to the lens head itself. Mounting the magnifier is simple – screw the base onto the side of any desk or workbench (approx. maximum table top thickness 55mm), and slot the magnifier into the bench mounted receptacle. The light can be turned on or off with a magnifier head mounted switch, with the unit itself plugged into a mains outlet via a generous 2 metre long cord.